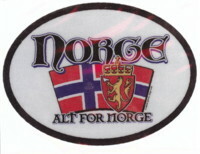 This "Alt For Norge" Flag-It Norge (Norway) Decal is a Laminated and Waterproof Decal. Thsi Norge Flag-It Decal was Made in the USA. This Flag-it Norge Decal is a Oval Reflective Decal. Flag-It Norge: Alt For Norge Decal is 3.5"x4.75" Norway oval-shaped decals printed on high quality laminated waterproof reflective vinyl stock.